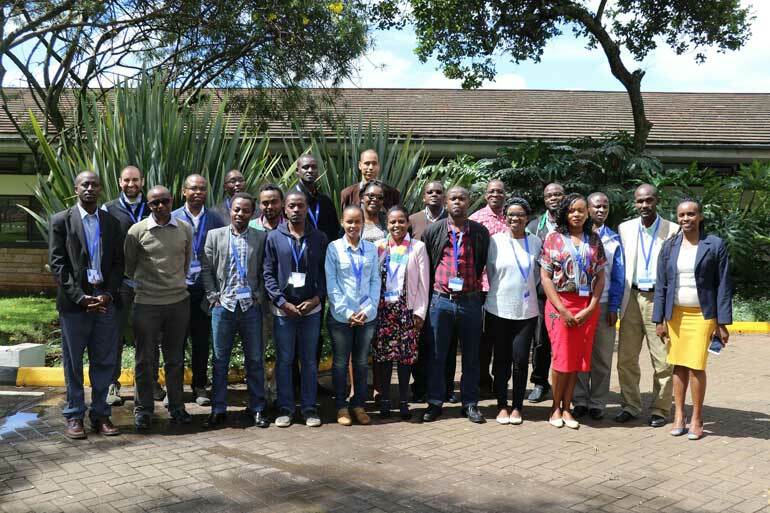 The John Innes Centre, Earlham Institute and the BecA-ILRI hub, Kenya, have jointly initiated a comprehensive 8-month training programme to address the critical shortages in bioinformatics capability in Africa. The programme named “Bioinformatics Community of Practice (BiX CoP)” is designed to build a strong self-sustaining network of bioinformaticians in Africa with expertise in data analysis for agricultural biosciences. It will be implemented in three phases: Build, Empower and Amplify. The first phase (Build) consists of seven formal training modules in various areas of bioinformatics including programming in the Unix environment, analysing NGS data, whole genome assembly, diversity studies, biostatistics and phylogenetics, and implementing bioinformatics pipelines over various hardware infrastructures. Each formal training module (one to two weeks each) will be followed by an exercise period of a similar length to ensure that the knowledge and skills acquired in the formal training modules are immediately used by the fellows. The second phase (Empower) will consist of a train-the-trainer programme and a final project, whereby the fellows will be taught skills to pass on their knowledge to other students and scientists, and will showcase their newly acquired bioinformatics skills on real-life analysis problems. The technical, transferrable and pedagogical skills impacted during these three complementary phases are not common place in many bioinformatic training programmes. Furthermore, it is hoped that hosting the carefully selected participants together for eight consecutive months will foster interaction that will build a self-sustaining “community” providing bioinformatics support beyond the training programme. Dr Jacob Mignouna, Director of the BecA-ILRI hub as a new sustainable model: “The BixCoP capacity building model, which is designed with sustainability and long-term impact in mind, is a new model that will help guide BecA-ILRI Hub ABCF program moving forward. I’m very excited with this new model of engagement of scientists in the region to jointly address the need of generating and utilizing bioinformatics tools to transform agriculture in Africa”. Remarks by Dr Wellington Ekaya- ILRI Head of Capacity Development: The BiXCoP training is a well-thought-out model that builds on past successes in capacity development at the BecA-ILRI Hub through the ABCF Programme. The programme has been shaped through engagement and partnership with individuals and institutions in Africa, Europe, USA and beyond. The BFX Cop aims at addressing a pressing capacity gap in Africa, which if addressed, will unlock Africa’s potential for harnessing advances in biotechnology to accelerate agricultural research and innovation. Its immediate potential lies in effectively supporting the existing 14 ABCF alumni-led Communities of Practice. The mission of the EI is tackling global challenges through life science research. EI's research brings together a wealth of expertise in biosciences, bioinformatics, high-performance computing and biotechnology to understand complex biological systems in plants and animals and their interaction with the environment. EI is supported by UK Research and Innovation Councils to ensure that biological science in the UK has access to a skill base in genomics technologies and bioinformatics to deliver programmes leading to improved food security, advances in industrial biotechnology and improved human health and wellbeing. The institute is located on the Norwich Research Park (NRP) and also houses the Earlham DNA Foundry for accelerating progress in synthetic biology.